Made in a facility that processes products with sulphites. Store in a cool dry place, Avoid Direct contact from sunlight. Ingredients: Dried Taro Leaves (100%). 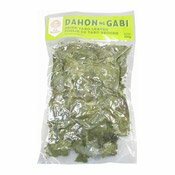 Simply enter your details below and we will send you an e-mail when “Dried Taro Leaves (Dahon Ng Gabi) (芋頭葉)” is back in stock!